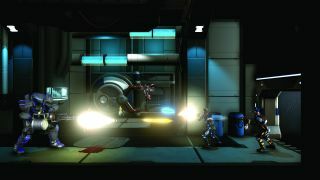 Originally announced in 2015, we take a first look the new version of this Shadow Complex-like game. Dystopian cyberfuture megacorps are good if you’re a dystopian megacorp CEO or a dystopian finance reporter who enjoys dystopian quarterly earnings calls. But they’re great if you’re a mercenary looking to make a quick buck exploiting dystopian corporate rivalries for futurebucks. Lucky, then, that Hollowpoint focuses on the latter. You might remember the name because Hollowpoint was previously being published by Paradox and turned up at the Paradox Convention in 2015. With the termination of developer Ruffian and Paradox’s relationship, the future of Hollowpoint and its neon-outfitted gunfolk was uncertain. The game has now changed hands and is being developed solely by Red Kite—a Huddersfield-based team who have worked on the likes of God of War and Dirt. Hollowpoint is a side-on 2.5D shooter. Mechanically, what catches the attention is your ability to aim into the screen to shoot things. If you know Shadow Complex, think Shadow Complex. If you don’t, it’s essentially a way of flowing between a 2D platforming experience and a shooting-gallery/cover shooter via the game’s aiming system. The game plays out as a series of procedurally generated contracts which you can pick up on the overworld map and which last about 15 minutes. In the vertical slice I saw, creative director David Roberts blasted his way through a mission to destroy a weaponised prototype belonging to one of the three key megacorps—in this case, Exgene. Two characters spawn in a rainy forest. One is AI-controlled but Roberts can hot swap between them to take advantage of different skillsets and weapons. In a two-player co-op game you’ll have two characters apiece and the same hot swapping, but for four people the AI characters are traded out for the remaining humans. Heading left rewards Roberts with a hidden intel point to activate – there are three on the mission and collecting all of them will yield extra goodies. The idea is to reward exploration and the procedural generation elements will ensure that the layouts, enemy placements and hidden areas are different if you repeat a contract. Roberts has god mode enabled for the purposes of being able to talk and play at the same time, but if you’re playing normally you’ll have to make decisions about when to swap characters, how to exploit destructible bits of the environment or when to duck into cover. Ducking behind cover would be good when the vengeful prototype starts releasing energy pulses between rounds of fire, for example. You’ll also need to keep an eye on your weapons—there’s no ammo collection, but you’ll need to manage their heat. Outside the contracts, you’ll need to focus on building up your mercenary organisation, unlocking character perks and abilities. My impression of the overarching structures of the game is that it’s a pared-down XCOM-inspired affair, so growing your crew of mercs, dealing with injuries and with an Ironman-like mode for the risk of permadeath. Red Kite also mention they’re hoping to tie the megacorps’ standings to the playerbase’s decisions, so repeated sabotaging of one of the main three could have consequences for that corp’s standing in the game world. That speaks to Red Kite’s hope that the game will find a long-term audience, keen to dip in for a few rounds with pals. But with so many games ravenous for your time already, Hollowpoint will need to make a strong case for a slot in your gaming rotation.